Soon, Holahan was spending Sundays visiting small farmers markets and independent grocery stores to find locally made products. 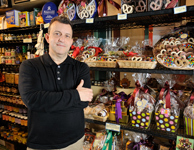 Eventually, the gift basket and mail order business grew so large that Holahan sold the boxed lunch venture and opened a retail outlet at the Reading Terminal. Twenty-five years later, the store is still a go-to source for goods made in the Philadelphia region. The store sells well-known treats like Tastycakes and Peanut Chews, but their shelves also stock Pennsylvania Dutch delicacies and an impressive variety of local handmade and bar chocolates. While the Internet has given people better access to these products, Holahan, who’s also a two-time president of the merchant’s board at the Reading Terminal, says that the store’s location has been critical to the business’ success.